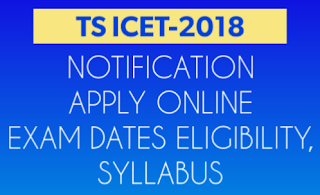 TS ICET 2018 Notification Released On Released on 22-02-2018 and Online Applications Start From 06-03-2018. TS ICET - 2018 (Telangana State Integrated Common Entrance Test -TS ICET) is for admission into M.B.A. and M.C.A. courses of all the Universities in Telangana State and their affiliated colleges for the academic year 2018-19. This test is being conducted by Kakatiya University, Warangal on behalf of Telangana State Council of Higher Education, Hyderabad. Kakatiya University has successfully conducted ICET in 2005, 2006, 2012, 2013, 2014 and TS ICET - 2015, 2016 and 2017. Then Take Print Out Of Application. For MCA: Should have passed recognized Bachelors Degree examination of minimum three years duration (Except Oriental Languages) with at least 50% marks (45% marks in case of reserved categories) in the qualifying examination with Mathematics at 10+2 level. 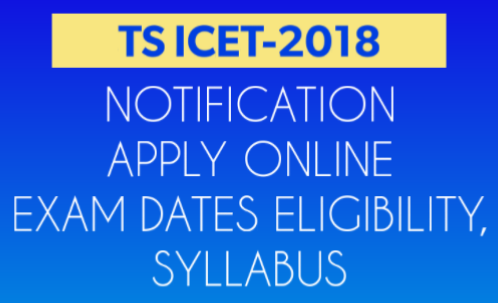 The candidates who are appearing for the final year degree examination shall also be eligible to appear for TS ICET - 2018. Qualifying marks in TS ICET - 2018 is 25% and no minimum marks are prescribed for SC/ST candidates. The Convener reserves the right to add or delete any centre from the list and allot accordingly: Hyderabad Karimnagar Khammam Kodad Mahabubnagar Nalgonda Narsapur-Medak Nizamabad Ranga Reddy Sangareddy Siddipet Warangal Kurnool Tirupati Vijayawada Visakhapatnam. a) Qualifying Marks for TSICET-2018: The qualifying percentage of marks in the Entrance Test is 25% (i.e. 50 marks out of total 200 marks). However, for candidates belonging to Scheduled Castes or Scheduled Tribes, no minimum qualifying percentage of marks is prescribed. (ii)If the tie persists, marks obtained by a student in Section-B will be taken into consideration. c) Rank obtained in TSICET - 2018 is valid for admission into MBA/MCA Course (Full Time / Part Time / Evening / Distance Mode) of all universities in Telangana State for the academic year 2018-2019 only. d) Evaluation: Every care will be taken to avoid errors in the evaluation, checking, scrutiny, tabulation and ranking. However, request for re-verification will be entertained on payment of ` 1,000/- by D.D. drawn in favour of the Convener, TSICET – 2018 (payable at Warangal drawn on any Nationalized Bank), within fifteen days from the date of declaration of results. After this date no request will be entertained. 10. The conduct of TSICET-2018 is subject to orders and instructions issued from time to time by the Government of Telangana and Telangana State Council of Higher Education. 11. All disputes arising out of any matter concerning TSICET-2018 shall be subject to the jurisdiction of High Court of TS & AP only. In such disputes, only the Convener, TSICET2018 and the Secretary, TSCHE, Hyderabad can be impleaded as respondents.